Jyoti Pawar played for the Rainmakers as a student at Prince Rupert Secondary School in the 90s and he's still proud of being a Rainmaker. Basketball is part of the culture in Prince Rupert, and for some, the pride of being a Rainmaker never wears off. 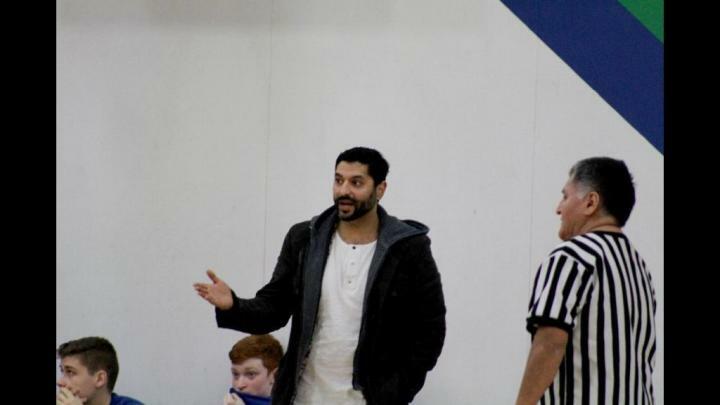 That’s the case with Jyoti Pawar, the Rupert product who is now the athletic director and coach of the senior boys basketball team at Brookswood Secondary School in Langley. Pawar, who was born in Rupert, was in town last weekend as his team clashed with the Rainmakers. He took some time to reminisce about his time in the city and the man it made him today. When he was in high school at Prince Rupert Secondary School (PRSS) between 1992 and 1996, Mel Bishop was already the coach of the senior boys basketball team. It’s him that Pawar feels he owes a lot to. “I want to thank Mel so much for all the years and times he’s put into me and given me, all those core values and just an understanding that it’s not all about basketball, but about life and understanding,” said Pawar from the couch in the lobby of Crest Hotel, where he and his team stayed while they were here. Playing basketball in Prince Rupert and learning under Bishop made Pawar the man he is today. It’s what taught him that the sport is so much more than just a game. “It’s the values you learn from basketball that are life values and things that will help with your life as you go further along, whether it’s with basketball or whatever you do,” he said. Pawar started playing basketball when he was 11 or 12. He recalls one particular incident that inspired him to become a Rainmaker. His mom’s cousins played at Caledonia Secondary School in Terrace and they were playing zone championships in Prince Rupert against the Rainmakers. Pawar remembers the ruckus crowd and the American basketball atmosphere. He thought it was incredible. “I was just proud to be from Prince Rupert and proud to be around these Rainmakers. Actually, that was an amazing experience and it was probably the first thing that turned me on,” said Pawar. That set him on the path to playing on the senior men’s Rainmakers with Kevin Sawka, who has been the junior boys basketball coach for the past 17 seasons. In his Grade 12 year as a Rainmaker, Pawar and the boys did something he still considers one of the highlights of his career. The team beat Caledonia in the zone championships and went on to play games at what was then GM Place, now Rogers Arena. It’s an experience he said was amazing. Another highlight of his later career was coaching alongside Bishop a few years down the road and taking the Rainmakers to fourth in the province. After graduating high school, Pawar stuck around Rupert for a year, taking classes at Northwest Community College before going to Malaspina College, now Vancouver Island University, in Nanaimo. He graduated from there with an English and phys-ed degree. Following that, he moved back to Rupert for a couple years, while trying to figure out his life. He was working at Alaska Ferries and was offered an assistant manager role there, which he turned down. Instead, he got his teaching certification and did his practicum in the north, through Simon Fraser University. Pawar completed his teaching year through Charles Hays Secondary School and PRSS, which is where he coached with Bishop. Fast forward a couple stops along the way in Ahousaht and Nanaimo and he now has been at Brookswood for the last 10 years, where he’s happy. “I love teaching high school and coaching at the high school level. I really do enjoy my job and I love going to work,” he said. He doesn’t have any aspirations of moving on to college or university coaching. Langley is home for him now, but he will never forget the community that raised him, especially the basketball community. The first thing many people ask him when they hear he lived in Rupert is if he was a Rainmaker. “Anywhere you go around the province, they know about the Rainmakers, the tradition, the pride, the culture of the Rainmakers,” said Pawar. The coach is following in Bishop’s footsteps of communicating to his players that their sport is more than just about basketball. “The game of basketball is just like education and teaching, where you can see the progress in people. I believe that it brings value to your life. If you work hard enough, you will attain whatever your goals are,” he said. Pawar said he really enjoyed the few days he spent here last week. It’s the first time he’s been able to actually catch up with people he knew growing up in approximately 10 years. Besides the basketball community, he says his favourite thing about Prince Rupert is the ocean. “It’s amazing. You walk five minutes down the road and you have this beautiful view of the ocean,” he said. Pawar may be gone now but as he said: Once a Rainmaker, always a Rainmaker.